On 4 February 1976, Michel Foucault, the eminent French social theorist, stepped gingerly down to the podium in a packed lecture at the Collège de France in the Latin Quarter on Paris’s South Bank. Delivering the fifth in a series of 11 lectures under the title ‘Il faut défendre la société’ (‘Society must be defended’), for once Foucault focused his attention on the relationships between western societies and those elsewhere in the world. Moving beyond his legendary re-theorisations of how knowledge, power, technology and geographical space were combined to underpin the development of modern social orders within western societies, Foucault made a rare foray into discussions of colonialism. Such ‘boomerang effects’ centred on ordering the life of populations at home and abroad – what Foucault called ‘biopower’ and ‘biopolitics’ – rather than on protecting sovereign territory per se. Foucault did little to elucidate these in detail, and rarely touched on colonialism or postcolonialism again. However, his notion of colonial boomerang effects is powerful because it points beyond traditional ideas of colonisation toward a two-way process in the flow of ideas, techniques and practices of power between metropolitan heartlands of colonial powers and the spaces of colonised peripheries. Such a perspective reveals, for example, that Europe’s imperial cities were much more than the beneficiaries and control points organising explicitly ‘colonial’ economic techniques of plunder and dispossession through shipping, plantations, mining, oil extraction or slavery. They were also much more than a product of the economic booms that came with the processing and manufacturing of resources extracted from the colonies. 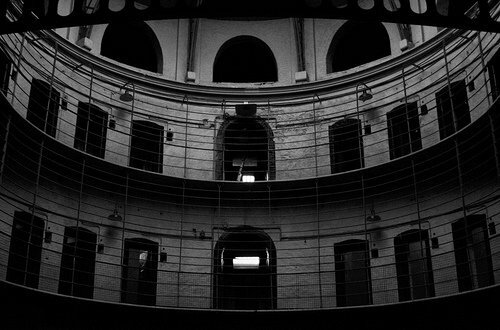 A Panopticon Prison. Craig Sefton. From the famous Panopticon prison, through Baron Haussmann’s radical restructuring of Paris through easily-surveilled boulevards, to the adoption of fingerprinting: many of the great transformations in 19th century European cities had already been tried in colonial cities and peripheries. Colonised cities and spaces also provided the zones of experimentation through which western powers were able to try out and hone techniques of aerial bombing, mass incarceration within concentration camps and genocidal extermination that laid the key foundations for totalitarian rule and total war in Europe in the 20th century. 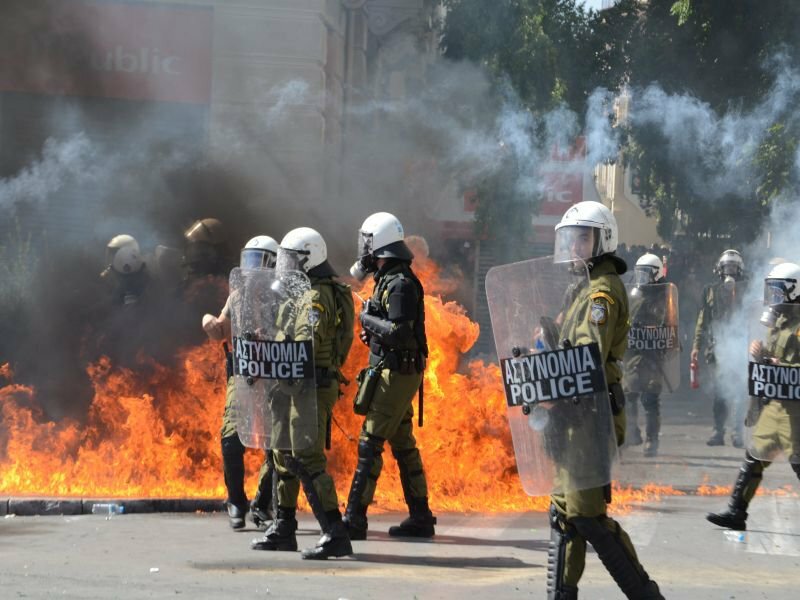 Protesters clash with riot police on the streets of Athens.Demotix/Nikolas Georgiou. All rights reserved. As our planet urbanizes more rapidly than ever before, a new and insidious set of boomerang effects are permeating the fabric of cities and urban life. Fuelled by, and perpetuating, the extreme inequalities that have mushroomed as neoliberal globalisation has extended across the world, this new military urbanism is a constellation of ideas, techniques and norms of security and military doctrine. As I demonstrate in my recent book, Cities Under Siege, these are linked intimately into the militarized and neocolonial predation of distant resources necessary to sustain richer and western cities and urban lifestyles. They fuse seamlessly with popular cultural worlds centred on militarized electronic entertainment, automobility, and urban lifestyles organised through new technologies that have military origins. And they relate closely to a proliferation of non-state insurgencies which appropriate the very architectures and circulations of cities as the means to launch their violence. Thus, Israeli drones designed to vertically subjugate and target Palestinians are now routinely deployed by police forces in North America, Europe and East Asia. Private operators of US ‘supermax’ prisons are heavily involved in running the global archipelago organizing incarceration and torture that has burgeoned since the start of the ‘war on terror.’ Private military corporations heavily colonise ‘reconstruction’ contracts in both Iraq and New Orleans. Israeli expertise in population control is regularly sought by those planning security operations for major summits and sporting events. Guided missiles and private armies work to securitise key events, from Olympics or world Cups, to g20 summits and political summits. Even the ‘shoot to kill’ policies developed to confront risks of suicide bombing in Tel Aviv and Haifa have been adopted by police forces in Western cities (a process which directly led to the state killing of Jean Charles De Menezes by London anti-terrorist police on 22nd July 2005). Meanwhile, aggressive and militarized policing against public demonstrations and social mobilisations in London, Toronto, Paris or New York now utilize the same ‘non-lethal weapons’ as Israel’s army in Gaza or Jenin. Constructions of ‘security zones’ around the strategic financial cores of London and New York echo the techniques used in Baghdad’s Green zone. And many of the techniques used to fortify enclaves in Baghdad or the West Bank are being sold around the world as leading-edge and ‘combat-proven’ ‘security solutions’ by corporate coalitions linking Israeli, US and other companies and states. Crucially, such boomerang effects linking security and military doctrine in the cities of the west with those on colonial peripheries are backed up by the cultural geographies which underpin the political right and far-right, along with hawkish commentators within western militaries themselves. These tend to deem cities per se to be intrinsically problematic spaces – the main sites concentrating acts of subversion, resistance, mobilization, dissent and protest challenging national security states. As ever, then, the imaginations of urban life in colonized zones interacts powerfully with that in the cities of the colonisers. Indeed, the projection of colonial tropes and security exemplars into postcolonial metropoles in capitalist heartlands is fuelled by a new ‘inner city Orientalism’. This relies on the widespread depiction amongst rightist security or military commentators of immigrant districts within the west’s cities as ‘backward’ zones threatening the body politic of the western city and nation. In France, for example, postwar state planning worked to conceptualized the mass, peripheral housing projects of the banlieues as ‘near peripheral’ reservations attached to, but distant from, the country’s metropolitan centres. Bitter memories of the Algerian and other anti-colonial wars saturate the French far-right’s discourse about waning ‘white’ power and the ‘insecurity’ caused by the banlieues – a process that has led to a dramatic mobilization of state security forces in and around the main immigrant housing complexes. The 2005 riots were only the latest in a long line of reactions towards the increasing militarization and securitisation of this form of internal colonization and enforced peripherality within what Royal Holloway Geographer, Mustafa Dikeç, has called the ‘badlands’ of the contemporary French Republic.. Indeed, such is the contemporary right’s conflation of terrorism and migration that simple acts of migration are now often being deemed to be little more than acts of warfare. This discursive shift has been termed the ‘weaponization’ of migration (Cato, 2008) – the shift away from emphases on moral obligations to offer hospitality to refugees toward criminalizing or dehumanizing migrants’ bodies as weapons against purportedly homogenous and ethno-nationalist bases of national power. Here the latest debates about ‘assymetric,’ ‘irregular’ or ‘low intensity war,’ where nothing can be defined outside of boundless and never-ending definitions of political violence, blur uncomfortably into the growing clamour of demonisation by right and far-right commentators of the west’s diasporic and increasingly cosmopolitan cities. Samuel Huntington, taking his ‘clash of civilisations’ thesis further, now argues that the very fabric of US power and national identity is under threat not just because of global Islamist terrorism but because non-white and especially Latino groups are colonizing, and dominating, US metropolitan areas (Huntington, 2005). Given the two-way movement of the exemplars of the new military urbanism between western cities and those on colonial frontiers, fuelled by the instinctive anti-urbanism of national security states, it is no surprise that cities in both domains are starting to display startling similarities as well as their more obvious differences. In both, hard, military-style borders, fences and checkpoints around defended enclaves and ‘security zones,’ superimposed on the wider and more open city, are proliferating. Jersey-barrier blast walls, identity checkpoints, computerized CCTV, biometric surveillance and military-styles of access control protect archipelagos of fortified enclaves from an outside deemed unruly, impoverished, or dangerous. In the former case, these encompass green zones, war prisons, ethnic and sectarian neighbourhoods and military bases; in the latter they are growing around strategic financial districts, embassy zones, tourist spaces, airport and port complexes, sport event spaces, gated communities and export processing zones. Crucially, the new military urbanism is sustained by a rapidly growing new security economy. This encompasses sprawling, transnational industrial complexes fusing military and security companies with technology, surveillance and entertainment ones; a wide range of consultants and industries who sell ‘security’ solutions as silver bullets to complex social problems; and a complex mass of security and military thinkers who now argue that war and political violence centres overwhelmingly on the everyday spaces and circuits of urban life. Amidst the global economic crash, so-called ‘homeland security’ industries – sometimes more accurately labeled by critical commentators the ‘pacification industry’ – are in bonanza mode. As the post 9/11 US paradigm of ‘Homeland security’ is being diffused around the world, the industry – worth $142 billion in 2009 – is expected to be worth a staggering $2.7 trillion globally between 2010 and 2012. Growth rates are between 5 and 12% per year. Importantly, the same constellations of ‘security’ companies are often involved in selling, establishing and operating the techniques and practices of the new military urbanism in both war-zone and ‘homeland’ cities. The main security contractor for the London Olympics– G4S, more familiar under its old Group 4 moniker – the world’s largest security company, is an excellent example here. Beyond its £130m Olympic security contracts, it operates the world’s largest private security force – 630,000 people - taking up a myriad of outsourced contracts. It secures prisons, asylum detention centres, and oil and gas installations, VIPs, embassies, airports (including those in Doncaster and Baghdad) and infrastructure and operates in 125 countries. According to its web site, G4S specialises in particular in what they term “executive style life-support in hazardous environments.” (Presumably this refers to Baghdad and not East London). After buying up the ArmorGroup mercenary company in 2008, it also now runs a large number of Blackwater-style security operations in Iraq. The new military urbanism is stealthy and insidious. Its circuits and boomerang effects operate beyond democratic scrutiny to in turn undermine democratic rights of dissent. Above all, its various elements work together to stealthily constitute a new notion of ‘normal’ urban life. This is based on preemptive surveillance, the criminalisation of dissent, the evisceration of civil rights, and the obsessive securitisation of everyday life to support increasingly unequal societies. The first challenge for those struggling against such trends, therefore, is to demonstrate that they are not an inevitable given in the nature of things. Rather, they are elements of a wider project of market-fundamentalist neoliberalism which, whilst utterly failed and wholly illegimate, rumbles on without (yet) a fully fledged competitor.